Systembolaget is a swedish company - almost an institution - that is state owned and has monopoly on selling alcohol to the swedish people. I think the name is sort of fabulous and needs further explanation to the world hence this post. 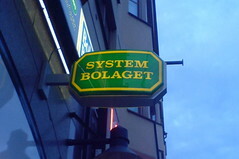 System is basically the same word in swedish and english and bolaget means "the company". So Systembolaget translates roughly to "The systems company". Systembolaget is a bit long to say so most swedes use the shorter "Systemet" that translates to "the system". So when we are going to get some beers for a BBQ we just say "I am going to the system to buy beer". So why is "the system" only used to selling alcohol - it could just as well sell anything systematic. Historic reasons obviously. I will get to that shortly. But first lets just visit our nordic neighbours for a quick check. All nordic countries except denmark (obviously....) has alcohol monopolies. They all have more honest names than their swedish counterpart. In finland it is the most honest - called Alko - no nonsense there. Norway has Vinmonopolet (the wine monopoly), Iceland got Vínbúðin (wine shop) and Faroe islands has Rúsdrekkasølan. I am not completely sure about what the latter means. Rús is being aroused or drunk and drekka is drink - together something like the swedish word rusdryck thats basically just another word for alcohol but literally means "a drink that gets you drunk".... Søla probably means shop in faroeish. It is not even a danish word. Back to Systembolaget. The idea behind systembolaget is actually quite old. In the mid 19th century, several cities introduced monopolies on alcohol sales starting in the cities of Falun and Jönköping. This was a side effect of the absolutism movement that appeared at the same time as the socialist and baptist movements. Although having different theoretical foundations they all share lots of common behavioral traits. In 1865 the idea was introduced in Gothenburg and was called the "Gothenburg system" and this is thought to be the origin of the name Systembolaget. By the end of the 19th century most cities had their own "systems company" and it was easy to put them all together in one big systems company in 1955. So there we are in 2010 with a alcohol monopol that we love and hate. At least it is open in saturdays now so you don't need to make your alcohol based weekend plans on friday. Ha ha, great post. I always wondered about the origin of Systemet. 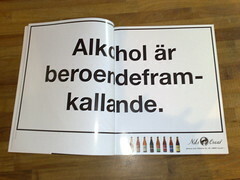 When I initially moved to Sweden I hated the fact that I could not buy alcohol where and when I wanted. By now I made piece with it, mainly because I also started to realize the benefits of Systemet which offers a much broader assortment to what any "normal" shop would do. I still get a little angry at summer times when Systemet prevents spontaneous grill parties by refusing to sell cold beer. God forbid that you are able to drink your cold beer right away after buying it. And yes, rather no beer than warm beer! Unfortunately many Swedes seem to ignore this mantra.